Everybody loves cotton candy, a delicious treat eaten all over the world at various events and even in the privacy of people’s homes. This sugary treat would traditionally be found at fairs or at the circus, mostly because of the labor-intensive way of preparing it. Nowadays, however, cotton candy is much easier to make, thanks to the many technological advancements made in the food preparation industry. 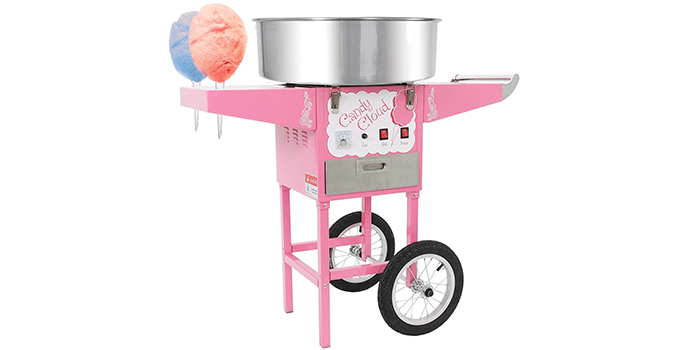 You can even get your own cotton candy machines for a reasonable price if you feel like it. So let us take a look at the ten best cotton candy machines out there so that we may better understand what they’re all about. The Paragon Spin Magic 5 machine works just like professional ones do, but is extremely portable by design. 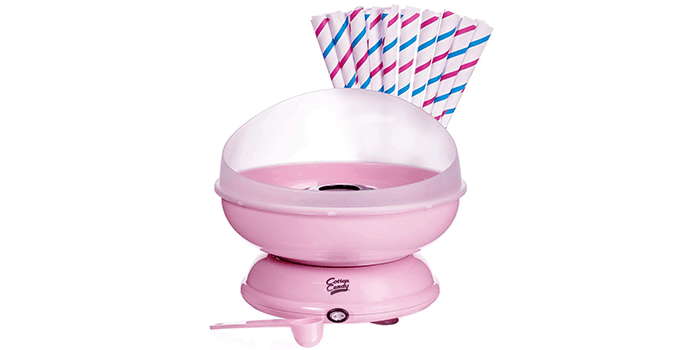 The machine features an aluminum bowl to collect the spun candy while the metal spin head is durable and long lasting. The machine comes with high-performance parts that don’t clog like most machines. One of the best parts about this device is that the stainless steel top can be removed for easier cleaning. The machine also boasts a chip-resistant coating which prevents any hazardous metal sticking to your cotton candy. 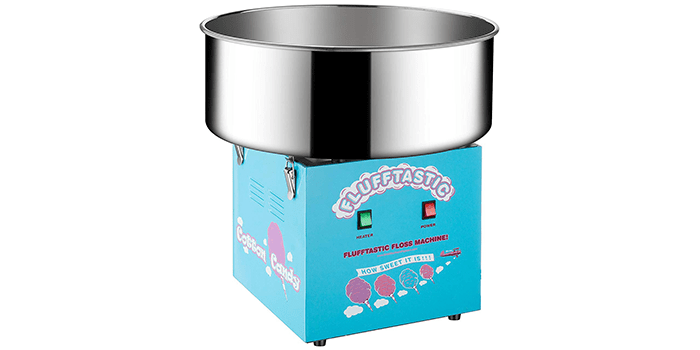 Definitely regarded as one of the most powerful cotton candy machines available, the Funtime FT1000CCP Candy Cloud Cotton Candy Machine can make a single cone of candy in just 30 seconds. For added safety, there is a built-in fuse which makes it ideal for indoor and outdoor use. It takes only 2 minutes for the machine to get hot which is extremely quick. 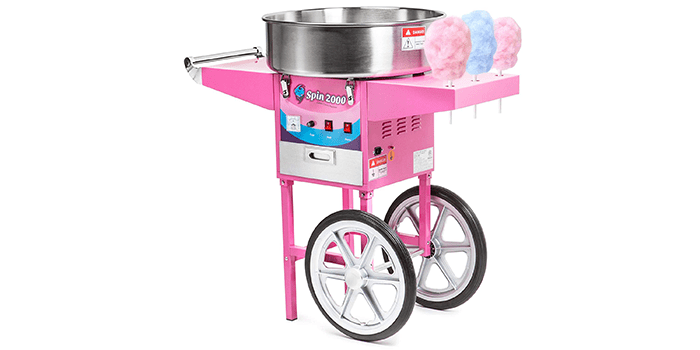 The machine also features a wheeled cart that makes taking the cotton candy machine anywhere even easier. With its stainless steel storage tray, you won’t have to worry about where to keep the extra sugar, cones, or scoops. 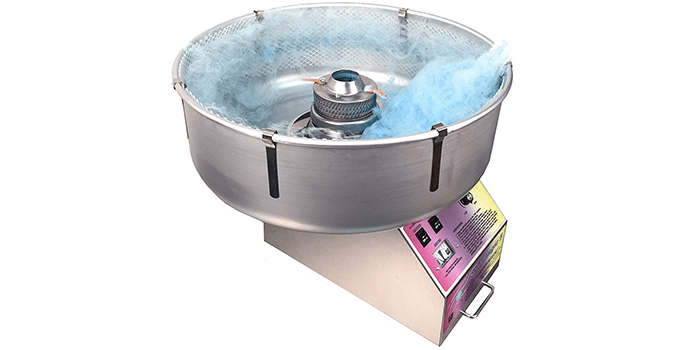 The Great Northern Popcorn Cotton Candy Machine is easy to use and produces fresh cotton candy within minutes. 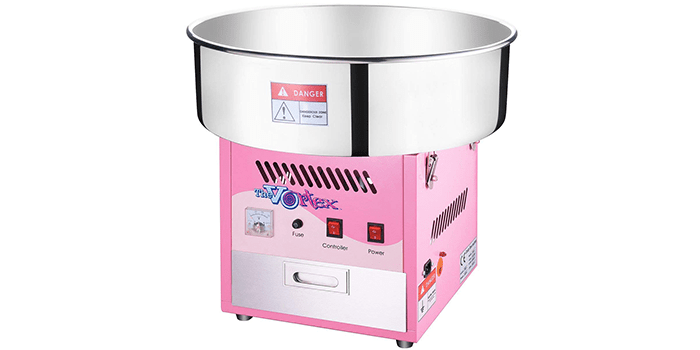 With 1080W of power and a 20.5” stainless steel bowl, you will be making delicious cotton candy for everyone in no time. In a minute, this machine can produce around 3 servings of cotton candy. It is easy to clean and maintain thanks to the high-quality materials used in its construction. Built into the machine, we find a 3 bin storage drawer which is great for storing scoops, sugar, or any other appliances. What’s more, the power switch and heat control are located on the front of the machine for better access. 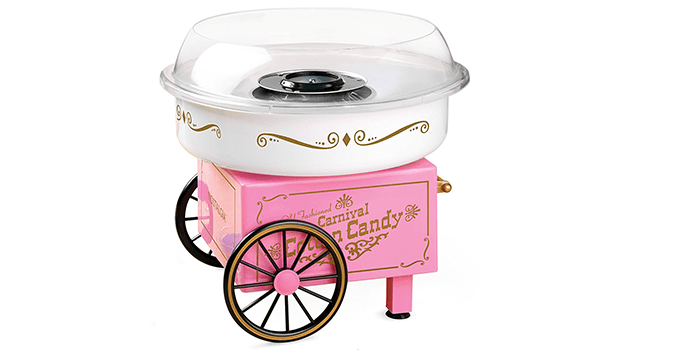 Standing out for all the right reasons, the Nostalgia PCM305 Vintage Hard & Sugar-Free Candy Cotton Candy Maker works with a number of ingredients including hard candy, sugar-free hard candy, and even flossing sugar. It works best with Nostalgia brand of sugar. The clear view rim ensures that you can see your cotton candy being made as well as it keeps the sugar inside the bowl while spinning. The feet of the machine have suction cups to keep it steady. Furthermore, this machine can be easily disassembled for cleaning purposes. The Commercial Quality Cotton Candy Machine from the Great Northern Popcorn Company is definitely one of the best out there. One of the biggest stand-out features is its simplicity. It takes 2 minutes to get started and then all you have to do is pour the sugar in and get cotton candy. It is also extremely safe and comes with Stainless Steel Pan Locks that ensure the machine does not turn on until it is locked in place. The machine produces 1 cone every 30 seconds. The machine also comes with a large drawer to help you store all your requirements easily. With the Cotton Candy Express Brand Party Kit, you can now take your cotton candy anywhere you like. This portable and lightweight machine produces one cone of candy in under a minute. The kit comes with a pink cotton candy machine, 50 paper cones, and grape, cherry, and blue raspberry flavored sugar. This is a great way to get the kids involved as well as they can make their own flavored floss. There are also plenty of other flavors available which gives you a wide range of delicious candy floss. 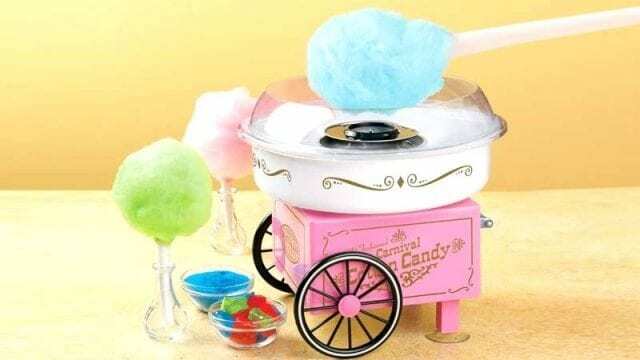 If there was ever an easy to use cotton candy machine, the Olde Midway Commercial Quality Cotton Candy Machine Cart and Electric Candy Floss Maker would be it. All you have to do is switch it on, wait for about 2-4 minutes while the machine gets hot, pour in the sugar mixture, and collect the sweet threads in a cone. The large stainless steel kettle is made from commercial quality material and is attached to a belt-driven motor. Making a cotton candy cone every 30 seconds, you will no longer have to wait to enjoy this delicious treat by using traditional methods. The Clevr Commercial Cotton Candy Machine is one of the most powerful in the market. It runs on 1030W of power and easily converts hard candy or sugar into silky strings of cotton candy or candy floss. The machine can make about 2-3 cones of candy floss in a minute. 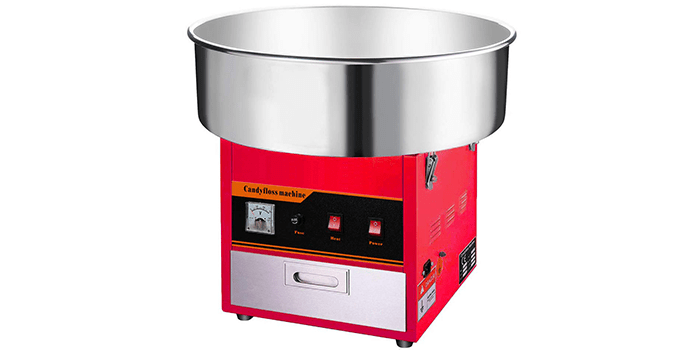 The machine comes with a stainless steel 20” bowl to help collect the spun sugar. Not just that but it also has a sugar scoop to give you the perfect amount of sugar every time. The best part about this cotton candy machine is that it can be disassembled for easy cleaning. 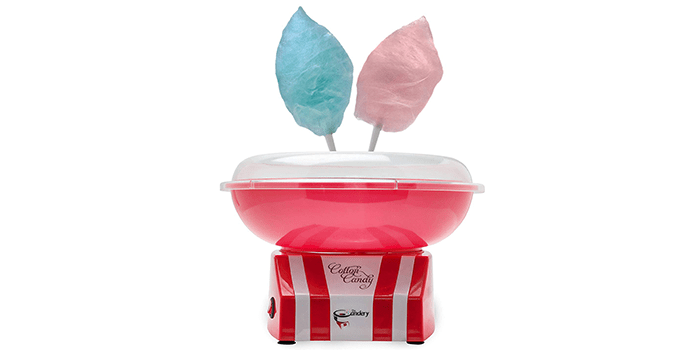 The Candery Cotton Candy Machine can not only make fluffy cotton candy but hard candy as well. It takes a few minutes to start the machine but once it heats up, you can enjoy delicious candy floss in just a matter of minutes. The design of the machine is modern and unique and fits into any kitchen style. Children can learn how to make cotton candy as well thanks to the protective clear rim guard. We should also point out that the kit comes with sugar scoops as well as 10 cones that you can use. 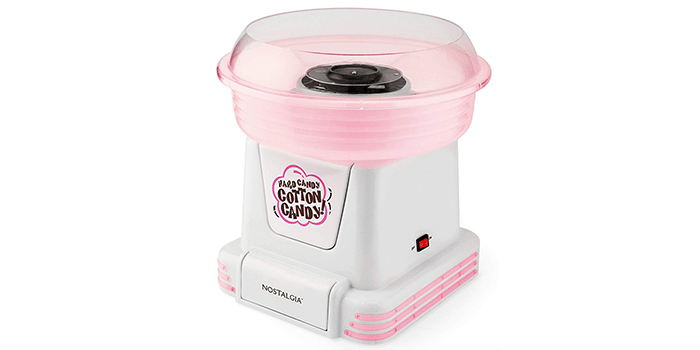 When you get the Nostalgia PCM805 Hard & Sugar-Free Cotton Candy Machine, you get to make your own sweet treats at home quickly and easily. The machine transforms hard candy as well as flossing sugar into candy floss. Thanks to the clear rim guard, you can not only keep the sugar inside the bowl, but you can also see what you’re doing. The kit comes with a sugar scoop, 2 reusable cones, and 1 extractor head. Last but not least, the entire machine can be disassembled easily and cleaned, which is one of its greatest features.